At any level of play, the pre-shot routine is an extremely important tool. It is the reference point from which to make adjustments. A sound pre-shot routine will also allow you to alleviate the pressure of a tight match by transporting you to a familiar and comfortable place prior to each shot. Golf Zoo is very pleased to have the Classic Club available now for our discerning clientele. The golf course is absolutely stunning, an Arnold Palmer design which will be in the Bob Hope Chrysler Classic rotation in January, 2007. The 360 degree views are awe inspiring and in true Palmer Design tradition, the course is challenging yet fair. For golf and service, this is truly a 5 Star experience. Good golfing and best wishes for the Holiday Season. One of the elements of a sound golf swing is good rotation. A key to this is keeping the club in front of your body throughout the swing. To accomplish this motion, the golfer must rotate the club head, hands and chest at the same rate. Try to visualize a dot on the club head, on the hands and in the middle of your chest. During the swing, feel like those three dots go to the top, back down through impact to a good finish position at the same rate of rotation. Check our Blog often to read new tips- the first tip will be posted next week! Thanks for reading! One of my favorite courses in Las Vegas will be turning private as of November 1, 2006. Dragon Ridge, a Jay Morris and David Druzisky design, is a totally awesome track. The moment you step onto the first tee box, you will be overwhelmed with the view of Las Vegas, along with an outstanding staff. The course features many elevated tee boxes which will "Wow" you all the way to the 18th hole. Dragon Ridge has hosted many tournaments, among them TigerJam 3 and 4 along with the Wendy's 3 Tour Challenge. They also feature a full service 60,000 sq. foot practice facility with driving range, short game area with sand bunkers as well as 2 bent grass putting greens. The 42,000 square foot Club House is a sight to see as well. While in Las Vegas, this is a must play, so be sure to get out there before the Dragon breathes it's final fire to the public. I just returned from a weekend golf getaway and I must say I was most impressed by the staff and golf courses at the Golden Horseshoe! The Golden Horseshoe is located in historic downtown Colonial Williamsburg, Virginia, and is home of two fantastic 18 hole courses, as well as a top notch executive course. I started off my day at the Gold Course which opened in 1963, designed by Robert Trent Jones Sr. This is one of the finest traditional golf courses you will find anywhere in the country. There are no homes on the golf course and the elevation changes are fantastic. This course is known for having the best set of par 3’s and I can attest, they are stunning but demanding. After a wonderful lunch in the clubhouse I ventured just down the road to the Green Course which has its own clubhouse. 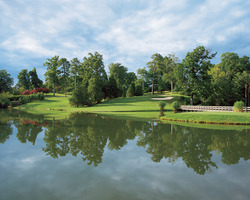 The Green Course was built by Rees Jones, (Jones Sr. 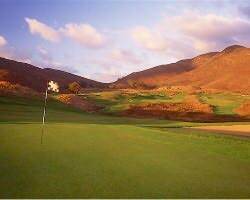 Son) in 1991 and designed to be more of a resort style course that is more forgiving then the Gold. It can best be described as a links style course bordered with trees. You still get the wonderful elevation changes but much larger landing areas and bail out areas by the greens. I had heard all the hype of the Gold Course (which it lived up to) but not much on the Green. Well the Green course is a fantastic layout, kept in great condition in beautiful surroundings. A must play. As I mentioned earlier there is also a super executive course- Spotswood, redone in 1963 by the elder Jones. This is one of the best executive courses I have seen and if you play 18 in the morning on either the Gold or Green you can get a free replay on the Spotswood in the afternoon. If you are looking for a great 36 hole day or just a super 18 give Golf Zoo a call at 800.929.7300 and we can put together a memorable golf vacation for you. 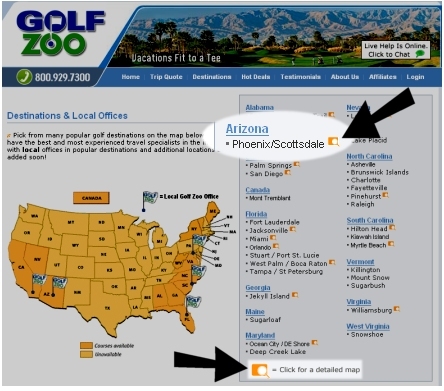 Golf Zoo seeks experienced Golf / Travel Salespeople! I know it's only Summer and most people aren't thinking about their winter golf trip. I'm originally from the Northeast and I know the weather can start changing as early as November. I've lived in Florida for over 8 years now and absolutely love it. I'm in Orlando and have played golf all over the state. Of the areas I handle, I would rank them in this order from top golf destination to bottom: Orlando, Jacksonville, Tampa, W. Palm, Stuart/Port St. Lucie, Fort Lauderdale, Miami. The ranking is based on quality of golf, travel time to courses, variety of course types and price. If you want a good mix of golf and nightlife then Tampa is your place. Only issue with Tampa is the travel to the different courses and some of the quality. South Florida is the night life capitol - but some of the golf can be suspect, or too expensive for what you get. Orlando and Jacksonville pose some of the best golf in the state, along with an expansive number of courses to choose from. If you need many places to eat and drink - Orlando is best. The weather in Florida for November and December is some of the best in the country. The courses are in great shape, the normal winter golf crowd hasn't arrived yet (Jan. - Mar. ), and the prices are attractive. 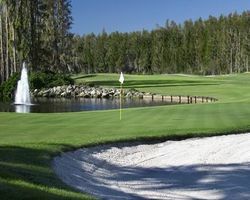 If you'd like to talk more about a Florida golf trip at the end of this year, please call 888.333.6103 to discuss - or go to our website and put together a trip quote (www.golfzoo.com) and see what you get. The Thistle Golf Club located in Calabash, NC is a must play on your next golf vacation to Myrtle Beach. There are 3 beautiful nines designed by architect Tim Cate and the owner has spared no expense in adding gorgeous landscaping throughout the facility. From the moment you drive through the gates you know the club is managed to give you a top-notch golf experience. The staff is wonderful and their attention to detail is impressive to say the least. A common complaint from many golfers at some golf courses is that they feel as though they are being rushed around and can’t enjoy their round of golf. Well at the Thistle they send out groups every 12 minutes to give you a full hole open in-front and behind you. Most courses send groups out every 8 minutes, which makes for a crowed golf course. You will be glad you have some extra time to look around as every hole is lined with beautiful wildflowers and perfectly manicured flower beds. If you are looking for a memorable round on one of the top courses in the area, give one of the Golf Vacation Specialists at Golf Zoo a call. We can give you more information on the Thistle Golf Club as well as hundreds of other golf courses. 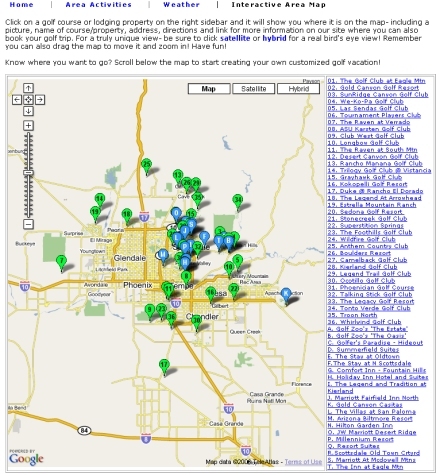 Planning your golf vacation just got easier with Golf Zoo's All-New Interactive Area Maps! If you haven't already seen them, have a look at this post for an example, what you can do with the maps and images. The First, is simply from our main destination map page that lists all of our destinations. 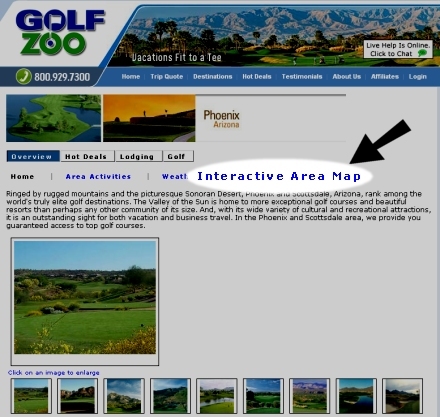 In the image below - the interactive map graphic/button is highlighted. The Second option is avialable when you land on the Overview page of a destination - click on the Interactive Area Map button near the top of the section - as noted in the image below. Once on the Map page - you have options on how you can view the map (see the below graphics). I suggest you select the "Satellite" or "Hybrid" views for a real bird's eye view of some of the golf courses and lodging properties. You can also get directions from from one point to another (the directions will open up on a new page). 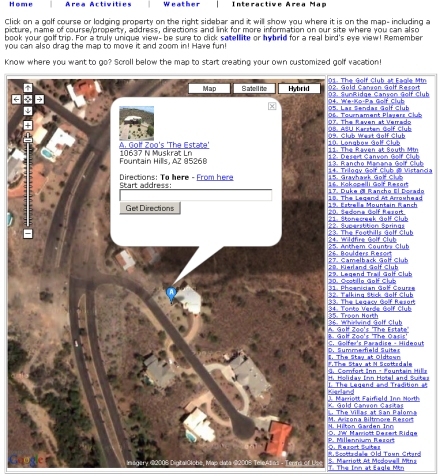 With name, address, pictures and address information available on every "bubble" it makes it easy to find out where you want to stay relative to the golf courses you want to play - or what golf courses you may want play given the proximity to your lodging property. 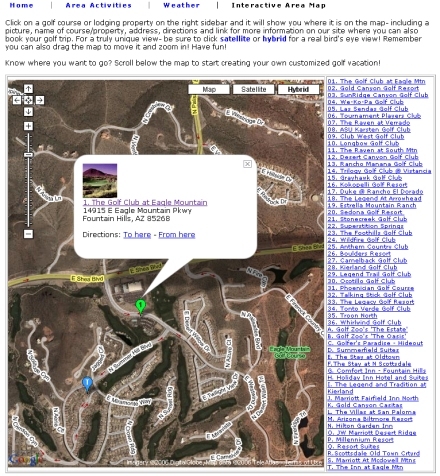 Simply select a property on the right side listing of options and the map will point out where it is on the map. Just want to see what's around a particular property? Thats fine too- you can also just click the points on the map to get the same information. All of the green number points on the map are Golf Courses and all of the blue lettered points on the map are Lodging properties. Clicking on the picture or name of the property in the 'bubble' will take you to that page in our site for more pictures and description as well. You can zoom in, click and drag the map to view anything on the map that you wish (see the below two examples). Have fun! Selected by Sports Illustrated as one of the Top Ten New golf courses in the world, We-Ko-Pa presents a unique alternative to the already upscale Scottsdale golf market. Bill Coore and Ben Crenshaw have teamed together for the new course at Wekopa called Saguaro. This design team, known for such highly touted courses as Bandon Trails, Sand Hills and Friar's Head in Baiting Hollow, NY are very excited about the new prospects at Wekopa. "This piece of land has some very interesting natural movement to it" said Crenshaw of the new Wekopa course. "I think this golf course will be pretty unique for the desert. People will be induced to play different shots and find solutions to new challenges when playing this course". 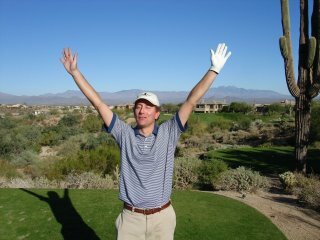 The new Saguaro course, located just north of the practice facilities, is scheduled to be open for play in December 2006. We are thrilled to have Escena Golf Club in Palm Springs in Golf Zoo's stable. Escena is a Nicklaus Design cut out of raw desert in North Palm Springs and is certain to be a huge success. The grooming of the course is impeccable, the clubhouse and driving range will be coming soon. Located near the Palm Springs airport, this is an upscale addition to golf on the western end of the valley which I'm certain will be well received. Next time you're booking a golf vacation with us, be sure to include Escena Golf Club, you won't be disappointed. The views of the surrounding mountains are awesome and the desert landscaping is simply beautiful. Enjoy ! 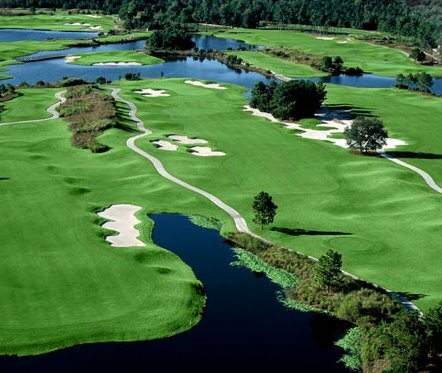 King’s North at Myrtle Beach National is a must play on your next golf trip to Myrtle Beach, South Carolina. This is one of my all time favorite golf courses because it gives you so many options for risk/reward golf shots in a beautiful setting. Home of the famous island green, featuring bunkers in the shape of “S” and “C” known as the South Carolina hole. Number 18, a 464 yard par four is framed by 42 individual bunkers. The most memorable hole on the course is the par 5 “Gambler.” On the tee box you are forced to make a decision to go for the island fairway and take a crack at the green in two or take the conventional route around the water. For all you northerners out there who love their bent grass greens you are in luck as all three courses at Myrtle Beach National have the true rolling bent greens. Give the staff of Golf Zoo a call at 800.777.7650 and one of our experienced Golf Vacation Specialists will help you put together your dream golf vacation. Play all day with breakfast and lunch included! If you like to play more than 18 holes in a day and have 2 meals included with it - then I have the place for you; the resort courses at World Golf Village -Slammer and the Squire, King and the Bear. These are two great golf facilities at one great property. During the months of July 1 through September 30, you can play all day with two meals. The Slammer and the Squire was designed by Bobby Weed with Sam Snead and Gene Sarazen as consultants. The King and the Bear is the only course in the US designed by Palmer and Nicklaus. A golfer can play all day with 2 meals for around $133 per day. The second round is not booked in advance, but day of play - 2 courses to choose from. The only issues are summer aeration: King and the Bear (8/22 - 8/24), Slammer and the Squire (9/5 - 9/7). It looks like July 1 through August 21 would be perfect. You have 4 different lodging options at the facility - Comfort Inn & Suites, Laterra Resort and Spa, WGV Renaissance Resort, and the Villa's at WGV. This package is for the diehard golfer that can deal with the heat, a lot of golf and a full belly. If this package interests you, please call 888.333.6103 to discuss. Plan ahead! If you want the "prime tee-times" you need to book months in advance. 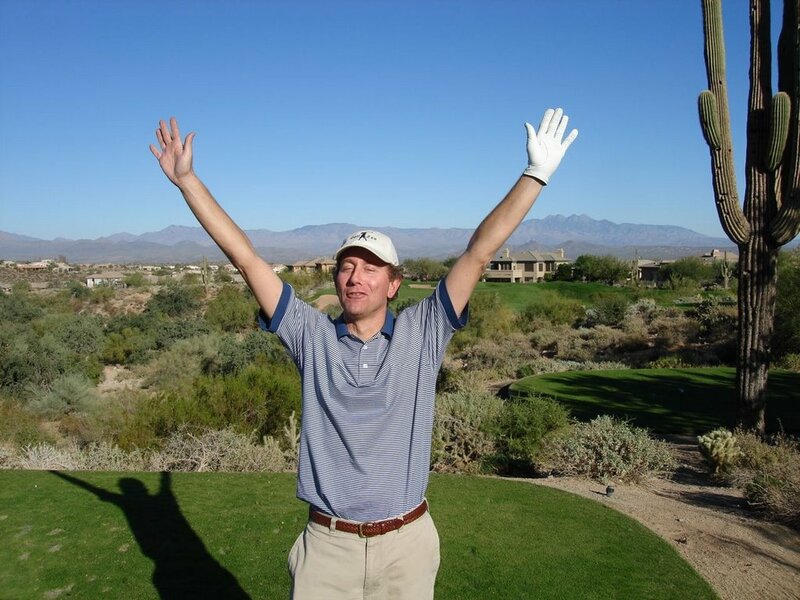 Many times package providers can book a tee-time six months before an individual can. Work with an individual that knows the area well and plays golf - not a call center with no personal touch. Make sure you know your dates of travel before you book or start quoting prices to your golf buddies. Golf travel prices are dictated by the time of year and one day can double the price. Ask when the rates change, and you can keep more of your change in your pocket. Have a pretty clear cut idea on what each individual of your Golf Group wants to pay for the trip. Be flexible with your tee times - everyone wants 8-9 AM, but remember that some courses offer reduced rates for late morning and early PM tee times. If you can plan your golf trip to happen during the week - rates can be lower than weekends and less crowded on the course. In some cases - Villas, Condos and Homes can be less expensive than hotels, and a lot more fun for the group. If a deal sounds too good to be true it probably is. So do your homework and find out what kind of "deal" it really is. Find out if you can pre-book replays and don't always plan on a tee time being available when you are done your first 18 holes. Don't spend hours making phone calls, changing tee-times, and leaving credit card numbers when all you have to do is call Golf Zoo. Do you have your own tips that you would like to share? We would love to hear from you! Post your comments below! 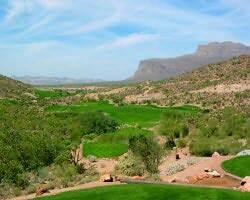 Coming to Scottsdale, and want to get as much golf in as you can??? Here (in my humble opinion) are the best 36 hole days in the valley. This is still my favorite 36 hole day. You've got both courses at the same facility, and it's good to warm up on the Sidewinder course in the morning, get your swing in shape, and grab a cold beer (and a prayer) at the turn to take on the formidable Dinosaur Mountain in the afternoon. It's a good 30-40 minute drive east from Scottsdale, but well worth it! For this one, you have to have 2 things... SOME GAME AND LOTSA CASH. Definitely one of the more expensive 36 hole combos, but worth the money if you wanna play where the pros do... Start at TPC Stadium, as the front nine is relatively gentle, and ends with a fantastic last 4 holes, then take the 10 minute drive north to Grayhawk Golf Club, where the clubhouse is spectacular, the service second to none, and the beer seems a little colder at Phil's Grill. Talon, a tougher test than TPC but not unfair for the typical hack if they play from the Terra Cotta tees. (5867 yards is all you'll want with this course if you're a 15 or more) I like Talon more than Raptor as it seems like the fairways are a little wider, and it has an island green on #17, "Devil's Drink" which is a great hole to take a little of your buddies pocket cash on a "closest to the pin" bet. Make sure to either have lunch before, or dinner after your round at Phil's Grill - great food and service, and some cool memorabilia. Scottsdale has alot of great 36 hole days, but in my opinion, (and I've done 'em all), these are Scottsdale's "Top 3".